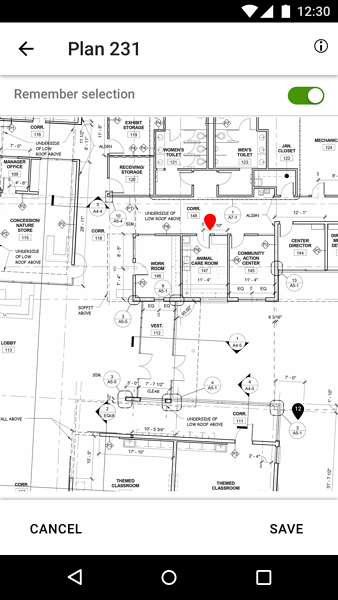 To add photos to floorplans and blueprints, tap on the Plan icon towards the upper side right. If multiple plans are associated to a project, a popup menu, will open with the selected project and available floorplans. Here you can change it if needed. Under Available Plans, select a plan that has been associated to the selected project. To associate photos to the floorplan, without adding pins, tap the Save button. The icon will turn red. TIP: When the Plan icon is red, this means that the next photos you capture will be associated to a plan. 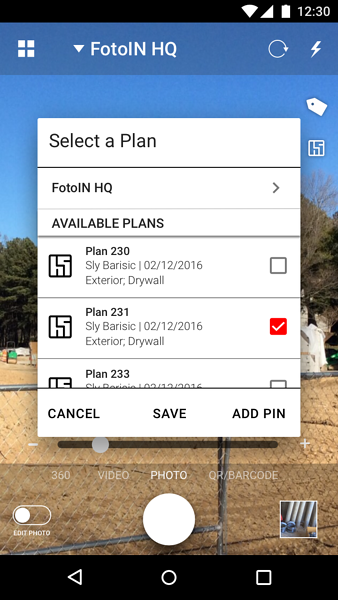 To add a photo pin marking a specific location on the selected floorplan, tap the Add Pin button on the popup menu. A new popup menu will open where you can view the floorplan. Use two fingers to zoom in/out of the plan. Tap once on plan to place a pin. Hold down on a pin to move it. Double tap on the pin to delete it. Once you are done, tap Save. The next photo (or photos, if 'Remember Selection' is turned on) will be added the pin. TIP: When the Plan icon is red & white, the next photos you capture will be associated to the last pin placed.